It’s exactly two years since Escentric 01 and Molecule 01 were launched on an unsuspecting world. Their creator Geza Schoen envisaged them as an intriguing new proposition in the world of fragrance: two scents introduced simultaneously as an homage to a single scent ingredient, or aroma-chemical. He was also keen to offer a clear-eyed riposte to the myths and flimflam of the fragrance industry. But Schoen – and his London-based collaborators ThisCompany and MeCompany – had no idea that his creations would instead weave their own intangible mystique, to the point where they have inspired an impassioned tribe of global devotees, from San Francisco to Sydney, Moscow to Manchester. And now the second chapter…Escentric 02 and Molecule 02 share the same relationship as their predecessors, Escentric the blend and Molecule the single aroma-chemical extracted from it. Molecule 02 is based on ambroxan, a nature-identical aroma-molecule. Real ambroxan is found in ambergris, but the stratospheric cost of its extraction makes it prohibitive for use in fragrances. Ambergris itself is one of the few natural animalic fragrance ingredients that has no connotations of cruelty because it is produced and excreted by the sperm whale. It can float on the ocean for years evolving under the influence of sun and salt water. Then it is collected when it washes up on shore, by which stage its distinctive nutty, warm scent is a symphony of boronal, ambrinol, dihydro ionone gamma – and its best-smelling aromatic part, ambroxan. Wear Molecule 02 and you will notice a fresh, almost mineral smoothness which subtly expands to envelop you. 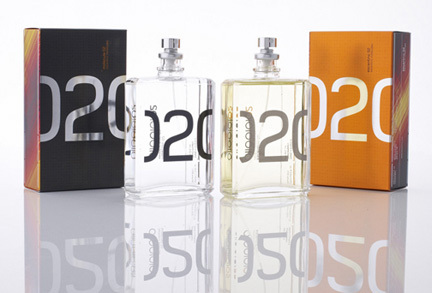 To purchase your bottles of Molecule02 and Escentric 02, click here. This entry was posted on Sunday, August 3rd, 2008 at 6:00 PM and is filed under Uncategorized. You can follow any responses to this entry through the RSS 2.0 feed. You can leave a response, or trackback from your own site.